Through tonight only, Macy’s.com is offering up $10 off a $25 purchase when you use the code DEALS25 at checkout. Plus, choose free in-store pick up if available near you; otherwise, shipping is $8.99 or free on orders of $75 or more. 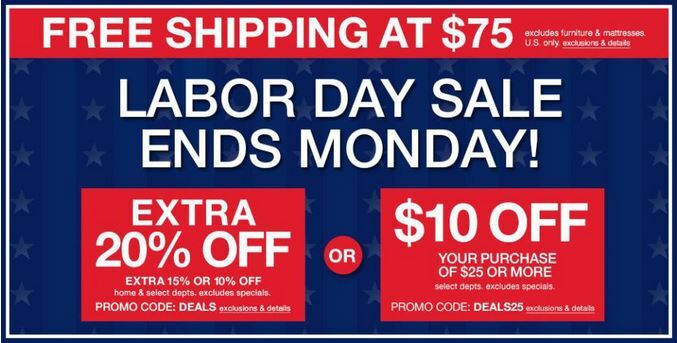 This is going to make for some pretty sweet deals to brighten up your Labor Day! What great deals do you need to score yet for the fall season? Maybe you should even start thinking about some great Christmas gifts! Make sure you sign up with Giving Assistant so you can earn an additional 3% cash back on your purchases!